We believe anyone with basic bicycling skills can quickly learn to bike competently and confidently on our roads, and we offer a fun and effective way to do so. 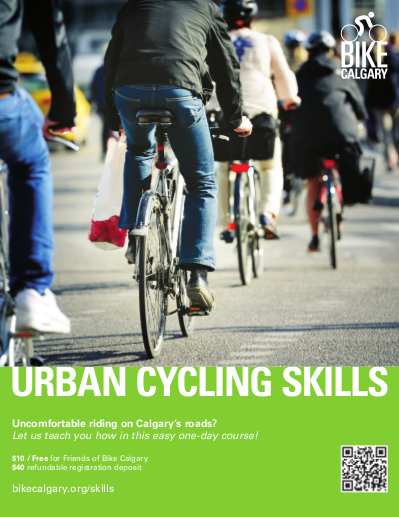 Modeled after the rigorous CAN-BIKE courses and taught by CAN-BIKE trained instructors, our one-day urban cycling skills course will increase your comfort level and confidence when navigating all sorts of streets—from quiet residential avenues to the busiest streets of downtown Calgary. Our one-day sessions run from 8:30 to 17:00 at the Community Wise Resource Centre at 223 12th Ave SW in Calgary's Beltline district. The course runs rain or shine, so you will need to dress accordingly. You will need to bring a bag lunch, and rain gear - and your bike, of course! Our goal is to provide our Urban Cycling Skills courses at minimal cost. Successful participants pay only $10 for the course (free for Friends of Bike Calgary -- contact us for a special discount code), plus a $40 registration deposit that is refunded when you successfully complete the course. (Should this deposit be too high for you, even though you're going to get the $40 back, please contact us and we'll work something out). If you don't pass the course on the first try, you'll receive a credit for a future course - we want to provide you with another opportunity to advance your skills to a comfortable level. Participants must be 18 years of age or older, although youths 14+ may attend if accompanied by a parent or guardian who is also participating in the course.